Germany - The Order of the Daughters of the King, Inc. The Order was introduced to Germany in 2004 by American women living in Heidelberg and a chapter of six members was instituted on November 21st. Unfortunately, due to military base and chapel closings, the chapter was disbanded in 2012. Institution of All Saints Chapter and Service of Admission in Heidelberg, Germany. The service was conducted on 21 November, 2004. The Reverend Gianni Martin, Verne Jones, Elizabeth Lim, and Rosetta Cass. The Revival of the Order in Germany! 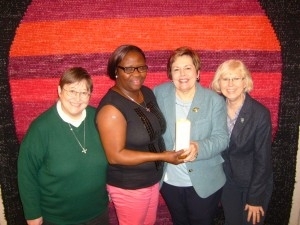 A group of four women at St. Boniface, Augsburg, Germany, had completed the study and were ready to be installed. It was unlikely that Daughters from the United States would be able to join them for the service there. But their Vicar, the Rev. Dennis Krumlauf and his wife, Jane, were in Orlando in January. The asked that the new chapter be instituted at the Cathedral Church of St. Luke, Orlando – including issuing the traditional crosses for prospective Daughters – so their admission service could be held upon their return to Germany in February. With the help of Rosemarie Valentine, the Daughters’ Regional Coordinator in Europe, who winters in Stuart, FL, and Krisita Jackson, Diocesan President of the Daughters of the King in Central Florida, the charter and crosses were presented to Rev. Krumlauf by Rosemarie and Krisita at the Cathedral on Sunday, January 13th. Several Daughters from Central Florida chapters were present to support the Krumlaufs. When the Krumlaufs returned to Germany they took the crosses with them to a service on January 27 where Bishop Pierre Whalon, Convocation of American Churches in Europe, blessed them. 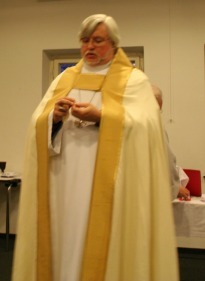 And then, at last, on February 3, 2013, the crosses and charter were presented to the four new members of the Gifts of the Spirit Chapter at St. Boniface, Augsburg, Germany. Service of Admission of The Daughters of the King® Chapter in Augsburg, Germany. Agnes Mannah and Jane Krumlaug, Chapter President. The Rev. Dennis Krumlauf presided. Gifts of the Spirit Chapter in Augsburg, Jane Krumlauf looks on. Father Dennis Krumlauf joins three Daughters from the Gifts of the Spirit Chapter on November 1, 2015 at St. Boniface, Augsburg, Germany.